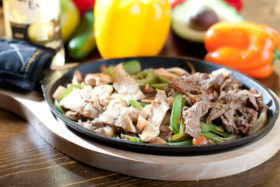 Fajitas are grilled and sautéed with onions, tomatoes & bell peppers. 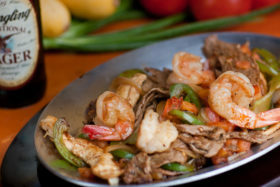 Served with rice, refried beans and warm corn or flour tortillas. Accompanied with shredded cheese, pico de gallo & sour cream. No Meat. 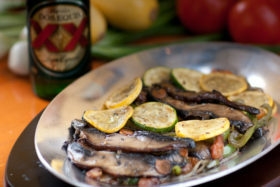 Veggie fajitas with grilled mushrooms & seasoned vegetables: onions, diced Tomatoes, bell Peppers, carrots, and zucchini.